Evaluation, not only as a business tool, but as a useful practice in education. This is one of the ideas highlighted during the recent openclass organised by UNIR-Tavistock Chair in Social Science for Education and Change. 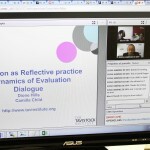 The first online conference between the Tavistock Institute of Human Relations (TIHR) and UNIR Research took place in June and was followed by a number of professionals, teachers and evaluators worldwide.